Little, Brown and Company, 9780316412391, 464pp. 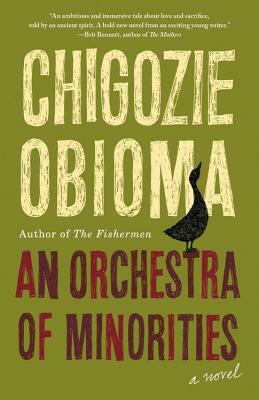 A heart-breaking story about a Nigerian poultry farmer who sacrifices everything to win the woman he loves, by Man Booker Finalist and author of The Fishermen, Chigozie Obioma. Set on the outskirts of Umuahia, Nigeria and narrated by a chi, or guardian spirit, AN ORCHESTRA OF MINORITIES tells the story of Chinonso, a young poultry farmer whose soul is ignited when he sees a woman attempting to jump from a highway bridge. Horrified by her recklessness, Chinonso joins her on the roadside and hurls two of his prized chickens into the water below to express the severity of such a fall. The woman, Ndali, is stopped her in her tracks. Bonded by this night on the bridge, Chinonso and Ndali fall in love. But Ndali is from a wealthy family and struggles to imagine a future near a chicken coop. When her family objects to the union because he is uneducated, Chinonso sells most of his possessions to attend a college in Cyprus. But when he arrives he discovers there is no place at the school for him, and that he has been utterly duped by the young Nigerian who has made the arrangements.. Penniless, homeless, and furious at a world which continues to relegate him to the sidelines, Chinonso gets further away from his dream, from Ndali and the farm he called home. Spanning continents, traversing the earth and cosmic spaces, and told by a narrator who has lived for hundreds of years, the novel is a contemporary twist of Homer's Odyssey. Written in the mythic style of the Igbo literary tradition, Chigozie Obioma weaves a heart-wrenching epic about destiny and determination. Chigozie Obioma was born in Akure, Nigeria. His debut novel, The Fishermen, is winner of the inaugural FT/Oppenheimer Award for Fiction, the NAACP Image Awards for Debut Literary Work, and the Art Seidenbaum Award for First Fiction (Los Angeles Times Book Prizes); and was a finalist for the Man Booker Prize 2015, as well as for several other prizes in the US and UK. Obioma was named one of Foreign Policy's 100 Leading Global Thinkers of 2015. His work has been translated into more than 25 languages and adapted into stage. He is an assistant professor of Literature and Creative Writing at the University of Nebraska-Lincoln. His second novel, An Orchestra of Minorities, was published in Spring 2019 by Little, Brown and Co.
frenetically assured second novel is a spectacular artistic leap forwards . . .
colourful African-English phrases, and the startling clarity of the dialogue. context of modern Nigeria, makes for a rich, enchanting experience." humans and spirits must interact in a complex, emotionally rich-veined story. masters-a cohort of gods presides over and negotiates the fates of humans. "—Okey Ndibe, author of Foreign Gods, Inc.